On Saturday 20 May, a protest called by the RCG and Rock Around the Blockade (RATB) was held outside The Guardian’s offices in London to oppose The Guardian's media war against Venezuela and the Bolivarian revolutions. While positing itself as a 'voice for the left', The Guardian has actively fought against socialism for decades, perhaps nowhere more unashamedly than in Venezuela, consistently supporting US-backed attempts at destabilising the region, including the 2002 coup that attempted to depose President Chavez, forcing power out of the hands of the people and back to the ruling class. In the current wave of violent protests against the government by the reactionary, imperialist-backed opposition, the newspaper has consistently taken the side of the right-wing anti-government protests, and reported their lies and distortions. It recently called for the country’s democratically-elected socialist president Nicolas Maduro to be given ‘pariah status’. The Guardian has not interviewed any member of the Venezuelan government or its supporters, while deliberately failing to address or condemn any of the violent actions of its right-wing opponents, including attacks on hospitals, schools, and bakeries that serve the people, and which have led to a rising number of deaths - a majority of the victims being government supporters. The Guardian's role in the conflict is to provide an ideological framework for another right-wing takeover. On the 1 April 2017, Victory to the Intifada and the Revolutionary Communist Group organised a rolling protest against businesses that trade with Israel. Despite a fascist march taking place in London on the same day the atmosphere on the picket was very lively with many different people speaking on our open microphone to point out different companies that had collaborated with the Israeli state. On 18 March, the London branches of the Revolutionary Communist Group marched with thousands on the Stand Up To Racism demo marking UN Anti-Racism Day. Our contingent carried a banner reading 'Fight Britain's Racist Immigration Laws' and calling for an end to deportations by the racist British state. Highlighting both the Conservative and Labour Party's history on immigration and of waging wars abroad, our message was to know your enemy - not only the small contingent of Britain First thugs who stood with their butcher's aprons, but the police protecting them and the whole vicious systematic machinery of British imperialism and racism. We operated a lively open mic on the mic and at the rally afterwards, with many people taking the opportunity to lead a chant or to speak out against racism. One man spoke of the four years he had been imprisoned in immigration detention centres, and how this had revealed to him the reality of Britain's treatment of migrants. This redoubled our determination to continue fighting racism and imperialism on every day of the year - not just on UN Anti-Racism Day. On Saturday 4 March 2017, London branches of the Revolutionary Communist Group (RCG) attended the People's Assembly March for the NHS, to protest against cuts and privatisation. The event was attended by thousands of people including many doctors, nurses and other NHS staff, who are directly affected by these brutal cuts everyday. We marched in the anti-racist block alongside the group Docs not Cops which fights against racist passport checks of migrants in the NHS. The RCG contingent focused on showing the link between healthcare services in Britain and Cuba, talking about how socialism allows a relatively poor nation like Cuba to have a health service that out-performs Britain and the US. The British ruling class is partially right when it says that Britain can no longer afford the NHS, as only through socialism can a truly sustainable and open health service for the working class be created. On 4 February, a strong RCG contingent joined the London protest to stop Donald Trump’s Muslim ban and oppose Trump’s upcoming state visit to Britain. The march was called by the Stop the War Coalition, Stand up to Racism and other organisations. The protest marched from the US embassy at Grosvenor square to Downing street, and attracted around 10,000 people. RCG supporters went to spread the message of anti-imperialism, anti-racism and how the issues that surround Trump and his rhetoric are very real and material issues that face many people in the UK as well as in the US. Slogans on RCG placards included: ‘Trump is the symptom, capitalism is the disease, socialism is the cure’, and ‘Fight Britain’s racist immigration controls’. RCG speakers and chants made clear that, whilst Trump is more explicit in his racism and sexism than other US governments, Obama led a violently anti-working class government, which deported huge numbers of migrants, tightened racist immigration controls, and dropped more than 26,000 bombs in 2016 alone. The British government, whether led by Conservative or Labour politicians, has also stepped up racist immigration laws. Imperialist countries rely on racist immigration controls, and these will increase as the crisis intensifies. Only a movement which fights for socialism can fight racist immigration controls. Members and supporters of the Revolutionary Communist Group joined Reclaim Holloway, Sisters Uncut, the Irish Republican Prisoners’ Support Group and others outside Holloway prison in north London on New Year’s Eve. A well-crafted visual display representing women and children carried messages and documented realities about women in prison. As each item was pegged on to the line protesters spoke about the realities of gender, race and class oppression behind women’s incarceration. On Saturday 3 December, the Revolutionary Communist Group supported a demonstration outside Yarl's Wood Immigration Removal Centre in Bedfordshire, the tenth in a series called by Movement for Justice by Any Means Necessary. The demo was called in the wake of the Brexit vote to stand in solidarity with the 400+ women detained indefinitely at Yarl's Wood and to demand the closure of Yarl's Wood and all other detention centres. There were approximately 2,000 people in attendance who had come from all over the country. On Wednesday 30 November, the RCG were among the two dozen social housing activists who responded to the call by Class War to protest outside Zaha Hadid Architects practice in Clerkenwell against their anti-working class, neoliberal principal, Patrik Schumacher. In a recent presentation at the World Architecture Festival in Berlin Schumacher claimed that council house tenants in central London are ‘free-riding’ and should be shooed along to make way for his staff members or those that supposedly generate wealth. This is just one of the many poisonous ideas that seem to spew out of Schumacher’s mouth; he recently lavished praise on those who have second homes in London: ‘Even if they’re here only for a few weeks and throw some key parties, these are amazing multiplying events.’ It seems astonishing that one of the leading voices in contemporary architecture can be saying that someone staying for only a few weeks is more entitled to a second home than one of the thousands of Londoners that don’t even have a roof over their heads in the first place. The Revolutionary Communist Group in London has been supporting the striking Deliveroo workers, who staged pickets and protests between 10-16 August to highlight the company’s attempts to attack their wages and conditions. At present Deliveroo bikers and riders are paid £7 an hour, plus a £1 extra for each delivery; however the company is attempting to switch them onto a scheme whereby they are paid £3.75 per delivery. The sustained action against this attack has focussed media attention onto the so-called ‘gig economy’ and garnered a lot of much-needed support for the strikers. The drivers and their union, the IWGB, along with other supporters have been organising daily pickets of the Deliveroo head office, strikes, and 'ride-arounds' to put pressure on restaurants using Deliveroo. In the face of the sustained strike action and boycott, Deliveroo have now withdrawn the requirement for workers to sign a new contract, and over a one month 'trial' of the new system workers wages will be guaranteed. There is now a need to strengthen the organisation of the drivers ready for the end of the trial when renewed attacks on pay and conditions may be launched. Victory to the Deliveroo workers! On Sunday 10 July, comrades from the Revolutionary Communist Group from all over London joined Focus E15 campaign on an exciting action to expose Newham's Labour council's housing situation. Congratulations to the Balcony 4 who successfully dropped banners from the disused, sold off and boarded-up police station in East Ham, London E6, opposite the town hall. This action took place on the second day of the Mayor’s Newham Show 2016, to let people know what is really happening in the Labour borough of Newham with Mayor Robin Wales at the helm. As the Mayor's Newham Show took place, this action unfolded. On Saturday 9 July, RCG comrades and supporters were amongst the thousands of protesters who joined a rally in Brixton’s Windrush Square in south London as part of a series of Black Lives Matter protests called over the weekend. There were other organisations there, such as London Black Revs, which originally called the protest, and Movement for Justice, but the majority of people were local individuals, spurred to come out onto the streets in opposition to the appalling police murders in the United States of Philando Castile in Minnesota and Alton Sterling in Louisiana. Fight Racism! Fight Imperialism! joined London Supporters of Tony Taylor in a picket of Theresa Villiers MP surgery on Saturday 2 July. As Secretary of State for Northern Ireland Villiers is responsible for the revoking of Tony Taylor’s license from an earlier conviction. Taylor, a Republican activist from Derry was seized while out shopping with his family and sent to Maghaberry Prison without questioning, charge or trial, having been denied legal representation. Following his release from Maghaberry in 2014, Tony Taylor was active in community and prison welfare issues and involved in rebuilding the Republican Network for Unity party in the Derry area. Over the weekend of 18/19 June, the RCG and its supporters in London were active on numerous events in defence of social housing. In many ways what we experienced reflected the rift that is opening up in the housing movement between those stuck in a path of parliamentary pressure and safeguarding a relationship with the Labour Party, on the one hand, and new forces involved in struggle, many on working class housing estates across London whose immediate enemy is… that same Labour Party. The march called by the Axe the Housing Act movement was a straightforward and sterile affair, consisting of a few hundred activists who gathered at Hyde Park corner in Central London. Some people within the movement had called for the march to go to Savills estate agents, whose headquarters is is located near the start of the march. Savills is currently involved in the sell-off and valuation of thousands of council homes, and the estate agent of choice for Labour councils such as Lambeth and Southwark. Savills works with Labour mayor Sadiq Khan, Housing Minister Brandon Lewis and others involved in drawing up housing policy for London. But in the event the route of the march took it through empty streets to an equally empty Parliament Square. 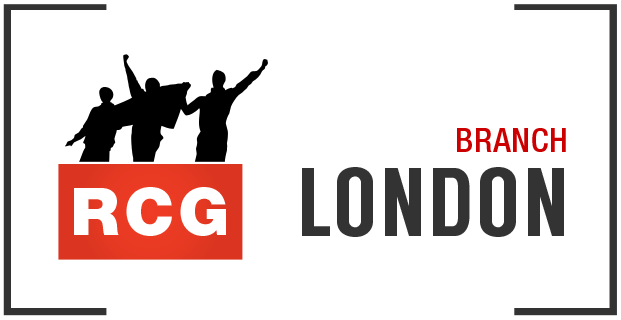 The RCG marched with a noisy, militant contingent from the Focus E15 campaign, which heckled the speaker from Southwark Labour council over its sell-off of nearly 8,000 council homes. Comrades from Focus E15 and the RCG spoke on the platform, exposing the role of Newham Labour council – and called on Labour leader Jeremy Corbyn to take a principled stance opposing austerity rather than writing to Labour councils instructing them not to set no-cuts budgets. On 16 June, representatives from London’s Labour boroughs of Southwark and Newham were met by angry protesters as they rolled up at the Municipal Journal Awards Ceremony, a self-congratulatory spectacle hosted at the Hilton. In the context of mass austerity, budget cuts and social cleansing the money was found to wine and dine hundreds of council lackeys as they patted each other on the back for their so- called ‘public service’. Of particular note in this celebration of self-delusion were Southwark and Newham Labour councils, who were up for ‘best local council’ and ‘best trading standards and environmental health’. What an insult to the thousands of families living in squalid conditions in Newham and those who have been evicted and their homes destroyed in Southwark. Defend the rights of Travellers! Fight the Housing and Planning Act! On Saturday 21 May the Revolutionary Communist Group joined a protest, entitled ‘Dosta, Grinta, Enough!’ It was called to challenge the new housing and planning laws that both redefine Gypsy, Roma and Traveller identity and seek to deny the community a culturally appropriate home. A demonstration took place in Parliament Square, where protesters took over the roads, marching loudly with horses and wagons, banners and placards claiming the streets of Whitehall! ‘Travellers have human rights!’ was the message shouted at Westminster! Representatives from Gypsy, Roma and Traveller communities across Britain and Ireland then held a rally opposite the Houses of Parliament. On Saturday 7 May London and Birmingham RCG branches travelled to protests at Yarl’s Wood detention centre near Bedford, and Harmondsworth detention centre near Heathrow, London, as part of a national day of action against detention and deportation of asylum seekers. The day of action saw protests taking place at detention centres across the country, including the Verne detention centre in Dorset, which Bristol RCG comrades attended, and Dungavel in Scotland, supported by Scotland RCG. This follows a large mobilisation on 12 March of 2,000 people at Yarl’s Wood. On Saturday 16 April 2016, the Revolutionary Communist Group joined the the Peoples Assembly demonstration demanding both Prime Minister David Cameron’s resignation and an end to austerity in this country. Thousands gathered in Gower Street, to protest against the government’s increasing attacks on the working class, before marching to Trafalgar Square. The RCG contingent was strong, and very motivated despite the grey weather. Side by side with anarchist and antifascist comrades, the RCG led chants, blasted music and provided an open mic for discussion, debate, and speech. Inspiring and thought-provoking contributions were made by RCG members, supporters, and the general public alike. Interwoven with political rallying was rap and spoken word, raising the spirits of those marching. Housing petitions were passed around, and badges and copies of FRFI were sold throughout the day. Comrades were openly criticising the Labour party, whose local councillors have been implementing savage cuts across the country. For example, we asked will the Labour Party refuse to evict those affected by the housing bill if it goes through parliament? So far they’ve refused to comment on the issue, so why were so many on this march calling for a Labour vote? Our invitations to the Labour supporters to engage in debate on the open mic over the nature of their party were met with uncomfortable looks, and silence. On Tuesday 5 April, a protest called by the Croydon branch of the Revolutionary Communist Group took place outside Lunar House in Croydon, the (Home Office) UK Visas & Immigration HQ, to raise awareness in opposition Britain’s latest racist Immigration Bill. The colourful and lively protest started at 10.30am, a busy time at the centre when migrants are effectively being told what to do with their lives, giving them a chance to get involved and have their voices heard. This is the building where deportations are processed, in many regards the epicentre of Britain’s racist immigration controls. On Saturday 19 March, the London branches of the Revolutionary Communist Group joined the ‘Refugees Welcome Here’ march, which marked UN anti-racism day. The march was organised under the name Stand Up to Racism, a trade-union-funded umbrella campaign. Around four thousand people marched from Portland Place to Trafalgar square. At Piccadilly circus supporters encountered around 100 members of the fascist group, Britain First, with banners reading ‘Veterans before refugees’. Protected by police, they made little impact on the demonstration of colourful and vocal anti-racists. On Sunday 13 March, the RCG joined the national demonstration in central London against the Housing and Planning Bill. The Bill, currently going through Parliament, is the latest assault by successive governments on the very concept of social housing (see this article in FRFI 248). Under its provisions, Right-to-Buy will be extended to the tenants of housing associations, with massive discounts. These discounts will, in a double whammy, be funded by forcing local councils to sell off their highest value properties. The Bill will also introduce a ‘pay to stay’ rule for council housing, where households earning above £30,000 ((£40,000 in London) will be forced to pay anything up to full market rent. It will strip away security of tenure in council housing, and even the limited definition of ‘affordable’ housing will be transformed to mean homes for sale – the government’s vaunted ‘starter’ homes that ‘start’ at £450,000. In addition, the ‘Planning’ aspect of the Bill will force councils to identify and make available public land for private development. On Sunday 6 March branches of the Revolutionary Communist Group supported the 'Stop Turkey’s War on the Kurds' national demo, a march from the BBC headquarters to Trafalgar Square that aimed to 'break the silence' of the British state and media with regards to recent Turkish state atrocities committed against the Kurdish people. The estimated 10,000 people marching, made up predominantly of the Kurdish community residing in Britain, were anything but silent. The Kurds demanded freedom for their people and nation, and carried placards carrying the powerful slogan 'ISIS: made in Turkey'. Indeed, the most recent atrocities committed by the Turkish state came as a punitive reaction to the PKK’s brave defeats of ISIS on Turkish territory. Demands to unban the PKK – shamefully listed as a terrorist group by Britain – were also heard. What is it? Corbynomics – taking its name from the leader of the Labour Party - is the term being used to describe a range of proposed measures for dealing with Britain’s economic crisis and ending austerity. These include expanding state investment, promoting higher wages, regulating banks and other financial institutions and undertaking a programme of nationalisation. Its origins lie in the ‘alternative economic strategy’ put forward by the Labour left in the 1970s and 1980s. It also harks back to the New Deal and the Keynesianism of post-second world war reconstruction. This programme is a far cry from socialism but even within its own progressive reformist terms currently stands no chance of being implemented by any British government because the conditions for class consensus – social democracy – no longer exist. On 30 January 2016 London branches of the Revolutionary Communist Group joined the March Against the Housing Bill, which went from Kennington to Downing Street to protest the Housing and Planning Bill, the final straw that will break social housing’s back. The controversial bill will lead to the loss of between 80,000 and 200,000 council houses, a disaster for the working class. With the extension of Right to Buy, the building of ‘starter’ and ‘affordable’ rather than social homes, and market rent being imposed for social tenants with household incomes of more than £30,000 (£40,000 in London), Britain is plunging further into an ever-deepening housing crisis. On Saturday 12 December, a contingent of Revolutionary Communist Group supporters attended the Stop The War Coalition's 'Stop bombing Syria' national demonstration in London. We came with the message 'Hands off Syria' and through the messages on our banners and our speeches and chants on the sound system, sought to emphasize the imperialist nature of this war and the central role played by British capitalism in promoting global conflicts. The Focus E15 table is innocent – release it now! On Saturday 5 December, the Focus E15 campaign was holding its weekly street stall in Stratford when police and a council official confiscated the stall table, bundling it into a police van like a person being arrested. This is the reality of the ‘right to protest’ in 2015. As usual the campaign had been drawing attention to the housing crisis in Newham, a Labour borough in east London, home of the 2012 Olympics and Paralympics and the second poorest borough in England. Newham has the severest housing need in London and 25% of homes are overcrowded. Thousands of people and families are in temporary accommodation and those that are offered housing are being sent out of borough and out of London. Labour Mayor Robin Wales, who in 1995 talked about ‘making Newham the new Islington’, is pushing ahead with gentrification. Newham is keeping over 400 council homes empty on the Carpenters Estate while luxury apartments are going up everywhere. On Saturday 5 December, members and supporters of the Revolutionary Communist Group assembled in Trafalgar Square for an open mic protest against British airstrikes on Syria. As the sound system powered out roots reggae rhythms, comrades gave some excellent speeches, denouncing British imperialism, the destruction of Iraq, Libya and now Syria. All these countries have been attacked on false pretences, with infrastructure as the primary target of bombing and capitalist profits as the motive. On 15 October, comrades from the RCG joined a variety of pro-Palestine activists on a picket of Marks and Spencer's flagship shop on Oxford Street. The picket, called and organised by the RCG campaign 'Victory to the Intifada', was held weekly for thirteen years in previous Palestinian intifadas (uprisings), and for three months in 2014 following the brutal Israeli assault on Gaza. M&S is one of many British businesses which sell huge amounts of Israeli produce, but it also offers political support to Zionism. The Palestinian people called for a 'Boycott, Divestment and Sanctions' (BDS) campaign against Israel in 2003. With the Palestinian people rising up against the Zionist occupation once again, in what many are calling the 'Third Intifada', the picket took the message of support for the Palestinian resistance to the streets, and called for a boycott of M&S and all companies supporting Israel. The response was overwhelming, with chants of 'Free Palestine!' drowning out the tiny but aggressive Zionist counter-picket. End British support for Israel! Focus E15 March Against Evictions - We will not be cleansed! We will not be silenced! The Revolutionary Communist Group joined the Focus E15 campaign on the streets of Stratford, east London, on Saturday 19 September, for the March against Evictions, marking the second anniversary of the campaign. The RCG banner read ‘Housing is a right, not a privilege!’ - and that is the message that the march put across as around 700 people joined the march from Stratford Park to the Carpenters Estate. London RCG branches joined the 'Solidarity with Refugees' march in central London on Saturday 12 September. We marched with the Asylum Clinic from West London, and the Focus E15 housing campaign from East London. Assembled behind a banner which read: 'Fight Britain's racist immigration laws!' we made clear that any movement which fights in solidarity with refugees must also fight British imperialism and its racist state. Our militant and lively contingent operated an open mic for all to speak out about the crisis and how we can build a movement in this country against racism and imperialism. Lewisham protest demands housing for Sandra, housing for all!